Even though lovers say that every single day is precious for their relationships couples can't deny what Valentine's Day means for them. So if Valentine's Day is around the corner and you haven't planned anything yet then it can be a good idea to think about a Barcelona Travel with your lovings. 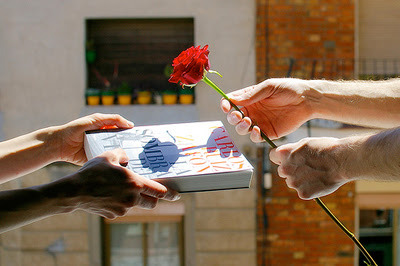 Despite Catalan Valentine's Day is celebrated as Sant Jordi Day on April and Spanish people refer Valentine's Day as Day of Corte Ingles there are many romantic activities in Barcelona on Valentine's Day. You can check the national holidays in Barcelona in our previous posts. How about starting the day with a big breakfast at Teresa Carles restaurant located in the city centre. You need energy so you should have big plates:). After breakfast you may want to get lost in a labyrinth called Horta's Labyrinth Park. While getting lost in this romantic park you will save unforgettable memories. Don't forget to take photos while walking nearby waterfalls and pavillons. After long walking you need a little bit relaxing. So why don't you make a reservation for two at a massage saloon? While relaxing with egzotic oils it is chance for you to prepare for flamenco at this special day. You can check the massage options and the prices according to your budget at this site http://www.lifestylebarcelona.com/wellness-in-barcelona/103 . You can make a reservation at Casa Xica for a romantic dinner. Smoked duck with selective local wines can be a good choice for the dinner with your loving. Closing the day with a flamenco night would be great and make your day unforgettable. Experiencing Barcelona city soul with your loving on Valentine's Day. Dancing, drinking and watching this spectacular dance show will be amazing. Please select a Flamenco dance show by clicking here .